Mike Conley drives har to the rim and draws a foul for a chance at a three-point play. 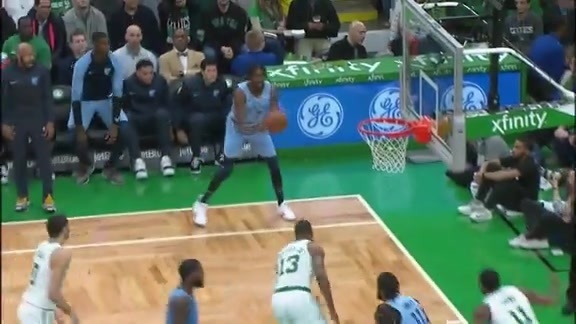 Check out the top plays from the Grizzlies match against the Celtics on Friday in Boston. Mike Conley scores 26 points in a loss over the Celtics. Omri Casspi steps into a deep three-pointer to cut into the Celtics lead. Justin Holiday knocks down a three from his favorite spot on the floor. 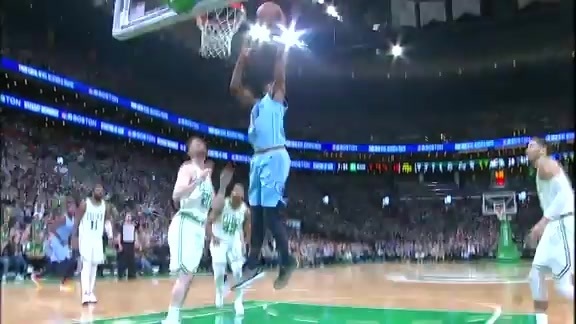 Jaren Jackson Jr. takes advantage of the mismatch with a vicious slam. The Grizzlies shot 16-for-35 (.457) from three-point range, the most threes made since Dec. 21 in Sacramento. Kyrie Irving scored 28 points in the second half to help lift the Boston Celtics past the Memphis Grizzlies, 122-116, on Friday night in TD Garden. The Grizzlies fell to 19-26 on the season and are now 8-16 on the road. The Celtics improved to 26-18 on the year. Boston has now won six-straight games against Memphis. Mike Conley led Memphis with 26 points. Conley has scored 20 or more points five times in the last eight games. Jaren Jackson Jr. finished with 23 points and four rebounds. The rookie has reached 20 points in eight games this season. Shelvin Mack supplied 15 points and seven assists off the bench. Justin Holiday reached double-digits for the first time in a Grizzlies uniform, finishing with 14 points and six boards. JaMychal Green and Omri Casspi chipped in with 12 points off the bench. Marc Gasol recorded the first double-double without scoring in double figures in franchise history, grabbing 11 rebounds and handing out 12 assists, while finishing with 4 points. 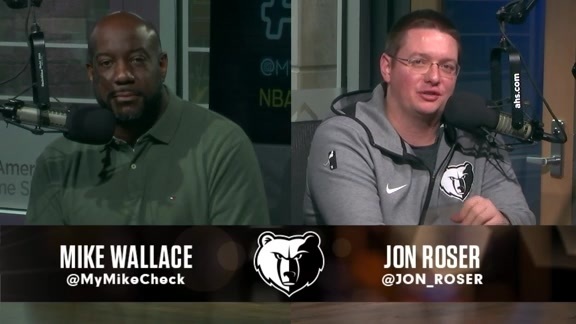 The Grizzlies shot 41-for-92 (.446) from the field in the game, including going 16-for-35 (.457) from three-point range, the most threes made since Dec. 21 in Sacramento. The Celtics went 44-for-86 (.512) overall and made 17-of-38 (.447) treys. Memphis dominated the turnover battle, forcing Boston into 17 turnovers (20 Grizzlies points) while committing nine (12 Celtics points). The Grizzlies shared the ball well, logging a season-high 33 assists in the game while the Celtics finished with 29 dimes. Memphis also won in the paint, outscoring Boston 48-34 inside. 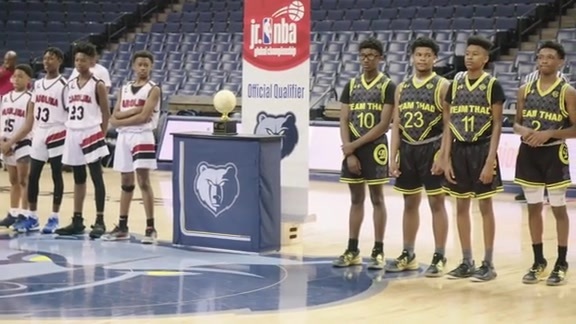 Seven different Grizzlies made at least two three-pointers. Kyrie Irving notched his 10th double-double of the season, scoring a game-high 38 points and dishing out 11 assists. Marcus Smart added 20 points, going 6-for-8 (.750) from three-point range. Smart has reached 20 points twice this season. Al Horford finished with 18 points on 8-of-10 (.800) shooting. Jaylen Brown added 12 points off the bench, while Terry Rozier scored 10. Boston maximized their possessions in the fourth quarter, shooting an efficient 9-for-16 (3-4 3P). 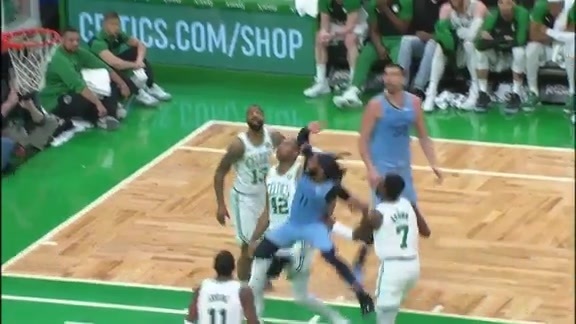 The Grizzlies forced the Celtics into six turnovers during the period, but Boston outrebounded Memphis 16-6 in the period, allowing no offensive rebounds for Memphis. The Grizzlies were ineffective from beyond the arc, missing eight of their 12 three-point attempts in the final quarter. Boston was rolling in the third quarter, making 14-of-26 (7-13 3P) shots. Memphis wasn’t far behind, going 10-of-22 (5-10 3P) from the field in the third, with Conley providing 11 points. Both teams moved the ball well, combining for 18 assists during the period. Irving heated up in the quarter, scoring 20 points on 7-of-10 shooting to help Boston lead 96-91 after three quarters. The teams shot almost exactly the same in the first half, as Memphis went 21-for-45 (.467) and Boston was 21-for-44 (.477). The Grizzlies were more effective from long range however, making 7-of-13 (.538) threes during the half while the Celtics were 7-of-21 (.333). Both teams also only missed one free throw apiece in the half. 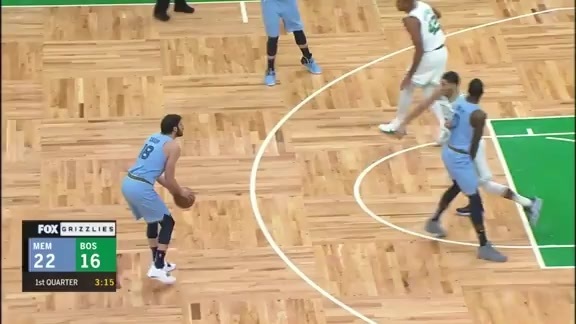 Boston turned the ball over nine times in the first half, leading to 13 points for Memphis, while the Grizzlies committed seven turnovers which the Celtics converted into 10 points. Conley (12), Green (12), Jackson Jr. (11) and Holiday (10) all reached double-digit points by halftime. Memphis struggled from the floor to open the game, going just 8-for-23 (.348) while also turning the ball over five times in the first quarter. Boston shot 12-for-26 (.462) in the quarter, but made only 4-of-13 (.308) three-pointers, with three of them coming from Smart. The teams combined to make 13-of-14 free throws, with Memphis missing the only one during the quarter. 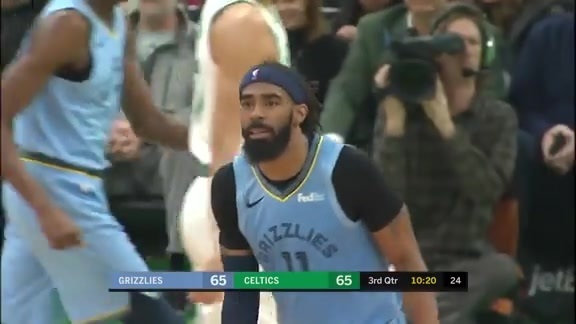 The Grizzlies went on an 11-0 run midway through the first from 6:07 to the 3:01 mark, but the Celtics followed it with an explosive 19-2 stretch of their own to close the first quarter with a 35-24 lead. The Grizzlies adjusted in the second quarter, outscoring the Celtics 38-23. Memphis made 13-of-22 (.591) shots in the quarter, including going 5-for-7 (.714) from three. Boston also shot well in the period by going 9-for-18 (.500), but committed seven turnovers which led to 10 points for Memphis. The Grizzlies outscored the Celtics 16-6 in the paint during the period. Holiday made back-to-back corner threes late in the period, and Conley dashed through the lane to sink a layup with 1.6 seconds left, to help Memphis take a 62-58 halftime lead. Memphis has outscored Boston 76-41 in the second quarter of their matchups this season. The Grizzlies finish the back-to-back with a trip to Canada when they take on the Toronto Raptors on Saturday, January 18 at 6:30 p.m. CT in Scotiabank Arena. Tune in to FOX Sports Southeast presented by Pinnacle Financial Partners or listen on 92.9 FM ESPN to follow the action. What was your evaluation of the team’s offensive effort tonight? I thought we did a lot of good things offensively. A 38-point second quarter, the way we moved the ball. The way we got contributions from guys all over the floor and up and down the roster. We make shots from behind the three like we did tonight, we can put pressure on teams and run the score board up a little bit. You’re playing a team that has a ton of offensive fire power. They have one of the best shot makers (Kyrie Irving) in the game. It is difficult to get stops when he is in his rhythm. I thought our guys defended him well, but he just made shots. Give him credit for that. Do you view this as a blueprint on how to play offensively moving forward? I think this is what we are capable of. Obviously, we make 16 threes every night, I don’t know if that will happen. Just the way we moved the ball and created for one another. We need to build on that for sure. What were you guys doing to hang in there? We were just making rotations, trying to play as hard of defense as possible. Just trying to continue to run, continue to get out and push. It didn’t work out. They hit some tough shots but I thought defensively we were getting back to what we usually do in terms of rotations. What is it like guarding men at this level? They’re physical. They’re scouting just like we scout so they’re trying at my weaknesses like I am trying to go at theirs. It is interesting both ways. They’re trying to get to their tendencies as well as trying to do what I don’t like to do. Jaren Jackson Jr. finished with 23 points and four rebounds. The rookie has reached 20 points in eight games this season. Shelvin Mack supplied 15 points and seven assists off the bench. Kyrie Irving notched his 10th double-double of the season, scoring a game-high 38 points and dishing out 11 assists.